But being the persevering Pierateer that I am, and because there were only more and more top crust pies as an alternative, I felt a sense of duty to still purchase and consume the pie anyways. After all, I’ve had many a top crust pie before, and was bound to have one again. But you could sense the disappointment and lower score it was going to get, even as I was reassured that the meat was really tender and would be delicious. So the pie itself... the lid was golden brown. Slightly too thick a shortbread pastry lid at points – presumably over doing the fact that there was a pastry shortage elsewhere around the pie! However the steak was really tender and delicious and the gravy was lush too. One down point to only being a top crust was that the gravy had already started leaking out. Highly disappointing, and shouldn’t happen in a real pie. 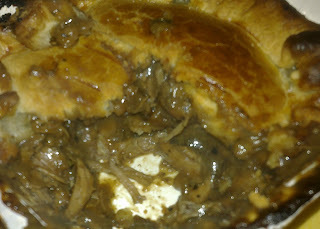 But while disappointing not to have a proper pie with full casing of pastry, it did taste nice and not badly priced at £2.39. And the great thing about 19 Gales farmhouse is that they "specialise in making high quality fruit and savoury pies". I have no idea where the name of the farmhouse comes from, but if you’re sweeping by and feel blown over into getting a pastry snack, you shouldn’t be (gale) forced into buying one of these, even if it is “just a top crust”! 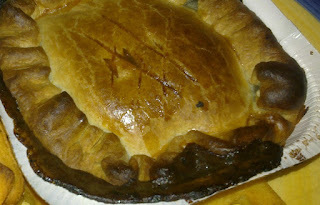 hi, i have 19 gales farmhouse food pie's every week! i have never had a pie looking like that! what have you done? by the look of the pie it looks that you have over heated it,as the pie is already cooked so all that you need to do is follow the instructions on the back. i prefer just the pastry top.the meat is all from their farm and the cows are free range. Everything is made on the farm. I would rate this 10/7 as this is the BEST pie in the area. Thank you for your feedback on this pie, we may have to pay another visit to try again. Sadly though this might be a very nice food product it will never be a 'proper pie' because it is top crust. As a minimum for a proper pie we follow the British Pie Awards definition of 'completely enclosed in pastry'. Although our definition tends to be stricter as we would never consider a pasty to be a pie. There are reasons that a pie is better, one being the height to width ratio. For your information here are some examples of things that are not pies. I CANT BELIEVE HOW YOU CAN SAY THIS!!!! 19 GALES IS THE BEST AND I CAN LIVE ON THERE PIES. I CANT SEE WHY THEY SHOULD BE LIKE THE REST RUBBISH WHICH IS WHAT YOU WANT TO HAVE MORE PASTY THEN MEAT? I THINK THESE COMMENTS ARE JUST RUDE! 19 GALES MUST BE GOOD ENOUGH FOR THE LIKES OF DRAYTON MANOR OR EVEN THE BELFRY. SO HOW CAN YOU BE SO RUDE AND SAY THAT ABOUT A SMALL BUSINESS WHICH IS BEING DIFFERENT FROM THE REST. IS IT REALLY THAT BAD. Thank you Anonymous for your comments. We appreciate everyone's comments and you are welcome to share how much you love 19 Gales Pies on our blog. Of course we can give our opinion to and use our 7 Cs pie rating system to give our score. Mentioning the score, 70% is actually quite incredible for something that doesn't have full pastry encasement - so well done 19 Gales! - and if there are fully encased pies on sale, we would LOVE to rate them as they are likely to score much higher. I'm intreged to know what you refer to as "bad" and "rude" in a review that gets 70%. 19 Gales do also make pies with pastry casing and I'm sure they would be more than willing to send you some samples for you to review again. They are superb ! !